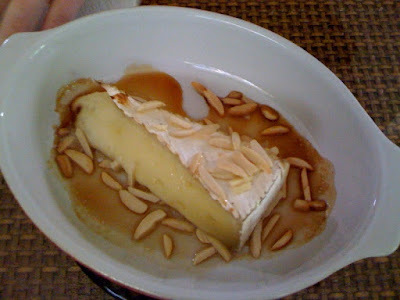 This is brie baked with honey and almonds. We were going to use walnuts, but didn't want to buy them so we used these almond salad toppings. It was so amazingly good. You can't bake it too long so that the brie gets too melty, but I don't know that brie ever really gets like that. I've never actually tried it. The only problem is that the honey and cheese cools down too fast and you have to eat it quickly while its still hot. 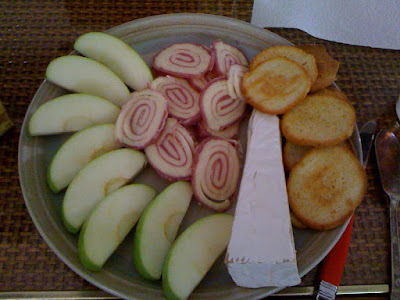 This is the rest of the brie and some apples and garlic bagel chips. I really like garlic bagel chips, but I think next time I might try a cracker that isn't too overwhelming because sometimes it was hard to taste the other food. Also, I always wanted those swirls of prosciutto and mozzarella, but never bought them while I was at school because my mom wasn't the one buying me food. But now that I am home, I can get whatever I want at the grocery store. It's great. So anyway, I finally bought some because I wanted prosciutto, but it was too expensive. So that's what those swirly things are. We ate them with melon. It was good, but it probably would have been better if it was just melon and prosciutto because there wasn't enough prosciutto for the melon. Today I made split pea soup with ham. Now I am making a quiche. what about a brie hotdog with brown mustard?